Everyone has their own version of aaloo paratha and here is mine. 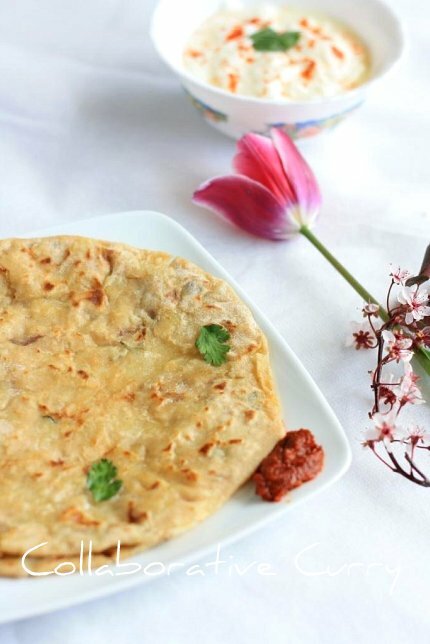 The most popular paratha is a favorite at my home. My kids are happy when I serve these and that in turn makes me happy. 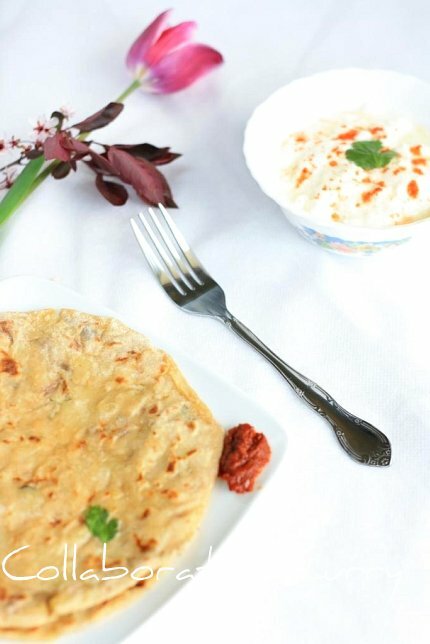 What I like the most about parathas is that I do not have to make any side dish to go with them. Whip up a raita (spiced yogurt) and a spoon of pickle and the deal is sealed. Photography: There have been a couple of questions over time about our photography. Neither of us feel equipped enough to field all your questions, but some of the basic information you asked us are as follows. We both use Canon DSLRs, do not use photoshop for editing. However, sharpness and contrast are worked on minimally at times using the software that comes with canon cameras or flickr. No reflectors nor special lights are used unless taken at night which is usually under tungsten light (regular bulbs). Both of us takes pictures by the windows and sometimes patio working with plenty of light. We hope some of this information is helpful. We will work on a detailed post covering our interest and what we have gleaned about photography over this short time of blogging. Please give us time as we don't foresee it happening at least for 6 months. We still think we are learning and growing in this area and do not want to talk more than we know. Thank you all for you continued support. 1.Mix the salt and flour, slowly pour the water and knead the dough well. 3.Meanwhile prepare the filling. Heat oil in a pan. Saute the chopped onions till they turn translucent. 5.Switch off the heat , add the mashed potatoes (make sure that there are no chunks) and chopped coriander leaves into this and mix everything well. 6.Make small balls of dough for making rotis. 7.Make the equal number of balls from the potato mixture too. These should be at least equal in size as the dough balls or bigger than that. 8.Roll each ball of dough till it reaches the size of poori, place the potato ball in the center and fold from all sides to close it. 9.Leave these stuffed balls with the closed edge facing to the bottom, and let it sit for at least of couple more minutes before rolling. 10.Repeat the same for other dough and potato mixture. You should keep the filled balls covered all the time. 11.Now roll out the stuffed balls till they reach about 1/4 inch thickness. 13.Serve with raita/yogurt and pickle/your choice of side dish. 1.Do not overcook the potatoes, also do not keep them in cold water for cooling them down. Both these lead to excess of water which is not good for parathas. 2.Keeping the potato filled dough for a couple of minutes helps to prevent the sides from breaking while you roll them. Meal in itself, perfect lunch with little pickle. My all time fav... Aloo paratha looks yummy and perfect... Nice click.. I totally agree with ss...fabulous clicks..kanditu vishanu poriyunu. Parathas are something that I just cannot seems to make..you make it look so easy! My most favourite paratha, just love it without any side dish...Beautiful clicks.. I have only had them with friends and that too in India. Never made them though i love them. Should try them once. Same here. Aloo paratha is fav in our house too. Awesome click... Kudos again. Aloo partha s one of my fav. yours looks faulous and yummy. beautiful presentation..
perfect aloo paratha...all time favorite breakfast at my house...yummy! Aloo parathas looks great..all time favorite..i too can have without any side dish..beautiful clicks dear. liked ur version of aloo paratha.. yummy! Allo paratha looks really yummy, Nice click. Adipoli. wow! I love this perfect and yummy parathas..Fabulous clicks as usual..
lovely and delicious and my all time favourie. I knw, many ways to do it, yet its the most preferred form of parathas.it looks so soft. Yummy paratha a family fav in our household. Thanks for the tips, the paratha looks fabulous! I could eat that anytime! Anytime give me aloo paratha..actually I made them 2 days ago..yours making me hungry again!! The less we edit : the pict will be good and even we learn to take a better picture. The parathas is wonderful click! Perfect parathas. Credit shd not be given only to the camera used but the angle,the exposure,the required zoom - all this credit goes to you:):) As usual, the perfect professional click which I look forward to, post after post. Oh, I love Aloo Paratha a lot. Urs is making me crave for more. I am going to make it today. Yumm.Nice click too. hello read about the details of the photography..i always like the photos..firt i check all ur photos then only reading the recipe. Aloo paratha, love it...and your pics speak a lot. all time favourite...comeout perfectly...nice picture dear! I love making this but I can't never get it as perfectly round like yours! I looking forward on your photography post later. 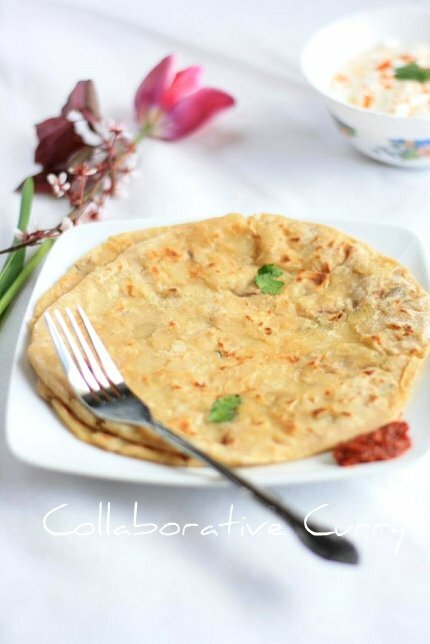 Next time, I will try this paratha just plain, and eat with curry chicken, sound delicious right? Thanks for sharing. Love the parathas, one of our fav too! Liked the parathas and your sealing the deal. This is Just awesome and looks so yum! I need to try this on one of the weekends! I love stuffed parathas....such a filling and delicious meal! Thanks for all the info on the photography. Your photos are always great! This is one of my FAVORITE things to eat- looks like you make it perfectly! Wow! This is my favorite classic! I'm drooling all over right now already! Wow Aloo paratha is so decadent ,love to have it irrespective of the counts .Awesome clicks . Lovely parathas, looks real soft and delicious. Thanks for the info on photography. Nothing can beat garma garam aloo parathas with yogurt n pickle...everybodys fav in my family. I would love this for breakfast and very beautiful clicks. Yum de dum! I love your clicks!! Hey u soo right....aloo paratha a meal on its own...me too make em in de same way. So elegant and beautiful. You are right, each recipe has some variation, i used roasted jeera instead of chat masala in the filling. Will follow ur recipe next time.